Stern Pinball's website has been updated with a few items on our support page. 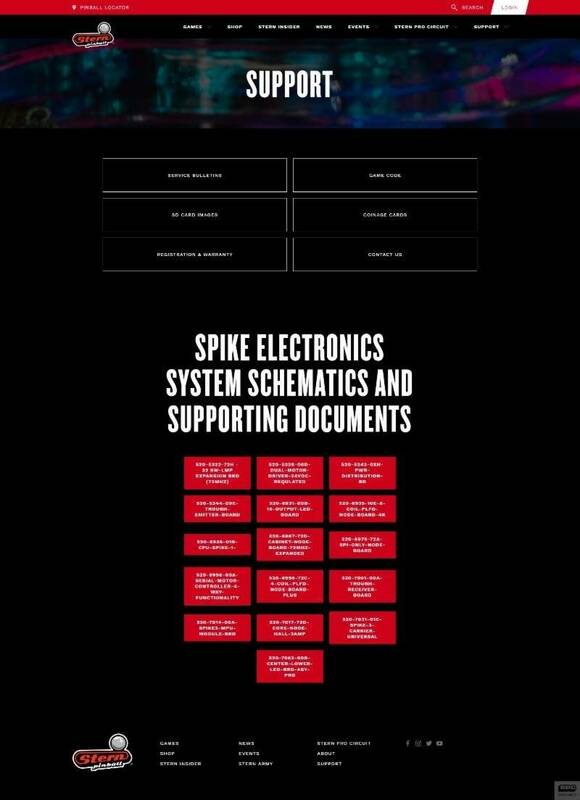 You can download the SPIKE Electronics System schematics and supporting documents on our main support page. In addition, we have added an option for updating code that utilize the SPIKE system. This option enables owners to create SD cards without assistance from dealers, distributors, or technical staff. Learn more about this time-saving option. Not every board is there, but it’s a start. Very nice, have some reading to do! Thanks for posting this info. My only Spike machine, Ghostbusters, has been going pretty strong but this is hopefully everything or a great start to anyone who has needed this info. Kudos to stern for hitting the deadline with a pretty big list. 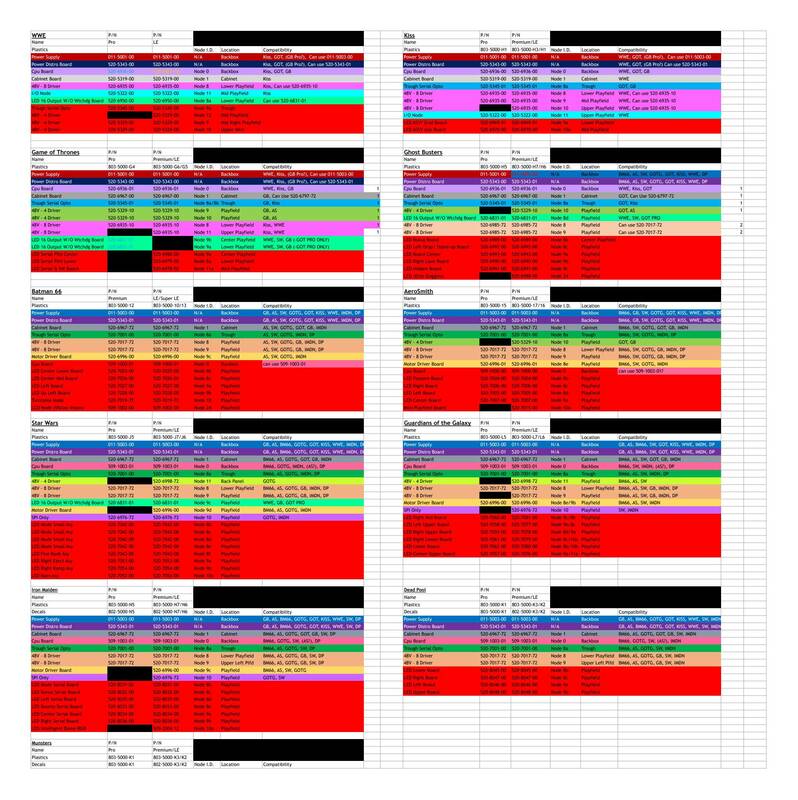 If it’s not complete, I’m sure that will be brought up and hopefully addressed. great to have though doesn't seem complete or some boards have had some updates like the node 8 board for Ghostbusters when comparing to this chart by another pinsider hocuspocus, the optional board is now I think a RevD, wonder if the same schematic works for the original Node 8 board??? Wow full images and not just an mini recovery os. no manual flash images for the nodes them self. So what is an owner supposed to do with this info? My KISS and Iron Maiden running on Spike are working just fine.... Do I need to do anything? If your Node Boards have issues and Stern does not replace them you may need it. Or, if you don;t do your own board work it may help the person you send them to. This is primarily for owners who generally do their own game repairs, and technicians who repair boards for others. and restore images are good for ANY end user as well. Hell an power fail when it's trying to update can mess up the file system / os. or if you need an true factory reset. it's not like you where unable to dump the card on your own. It's just took them forever to post the full recovery images. Spike v1 games have iso files. I hope Stern doesn't forget "The Pin" machines because they also use SD cards. The SD image files are also needed for those machines too and are not currently on Stern's website. You never know when a card could get corrupted and need to be restored. The schematics are also needed for these machines, especially the cpu board.